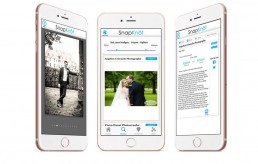 SnapKnot is an ideal destination for finding the best local wedding photographers in your area. Online wedding photographer directory of affordable wedding photographers lets you browse and discover new photographers with one click. Michael Rheaume and his partner had a web platform for wedding photographers. They saw the opportunity during an early release of iPhone and IOS. They quickly decided to grab the opportunity and create a platform for smart devices where couples can easily find the wedding photographers and quickly communicate with them. Snapknot is a marketplace for photographers. The goal of this marketplace is to make couples’ lives easy when they want to search for wedding photographers and communicate with them. This app offers solutions ranging from affordable wedding photographers to high-end photographers, which vary in style, price and locale. These custom filters help couples in choosing photographers as per their requirements. Snapknot has lot of search options for couples to search from within their budget. We also implemented a custom slider control so that users can set the budget boundaries and search effortlessly as per their needs. Overall we were very happy working with the Sunflower team. The communication and response time were excellent. The development speed was especially good. We had some internal delays but Sunflower was able to pick up where the project halted and deliver according to our project scope and budget in a timely fashion. 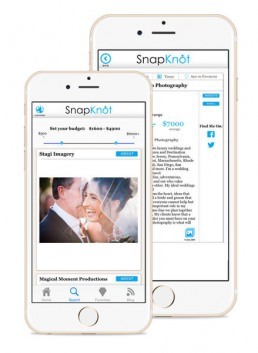 Snapknot lets couples compare and communicate with a photographer of their choice. It also lets the couples browse, compare and discover new photographers with just one click. Individual profiles include photos from previous weddings, links to their websites and social media pages, price range, styles they shoot in, and contact information that let couples directly connect with these photographers. We have been pleased with the end result, and so far our released app has received a great deal of positive feedback from both photographers and end users. We have already recommended Sunflower to a couple colleagues,would recommend them to others, and look forward to working with them on future projects as well.